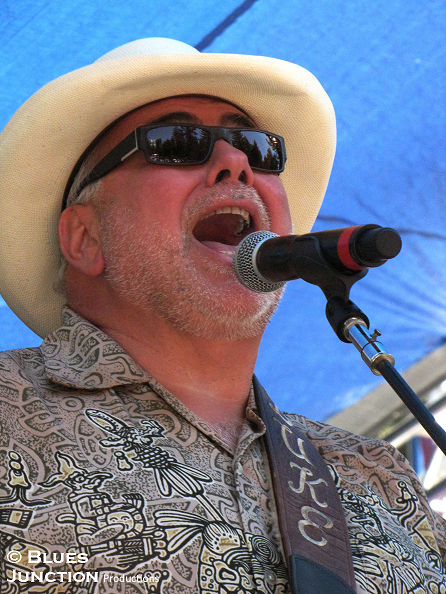 Michael John “Duke” Robillard is a man who personifies the modern blues musician at its very best. He is a serious student of the music and a dedicated practitioner of the form. He is a master craftsmen, whose recording career stands as a monument to excellence. He has over thirty albums released under his own name. That is a stunning achievement in and of itself. Yet it is the high batting average and diversity of the material within the blues and jazz umbrella that is explored by Robillard which makes this legacy even more astonishing. His guitar can also be heard on recordings by everyone from Jimmy Witherspoon, Rosco Gordon, Bob Dylan, Jay McShann, Ruth Brown , Dr. John, Tom Waits, the Fabulous Thunderbirds, Johnny Adams and the band he formed that became a musical institution in its own right, Roomful of Blues. Truth be told, I have just scratched the surface. He is also a highly sought after producer and even started his own record company a few years ago. I caught up with the man who is true blues royalty, Duke Robillard. David Mac (David): Do you remember your first encounters with music as a child? 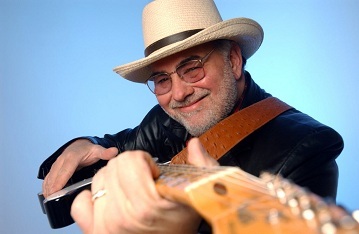 Duke Robillard (Duke): I do. When I was six I heard a lot of western swing and country music, Hank Williams, Ray Price and people like that. Soon after that, when rock and roll came into being, my brother, who is 10 years older than me had collected all the records of the great rock and roll artists of the time, Chuck Berry, Little Richard, Fats Domino, Jerry Lee Lewis, Elvis. I got into that really early. By the time I was six or seven I started seriously wanting to play that music. DAVID: Did you start out on a guitar? DUKE: I did. I taught myself really. My brother played guitar a little bit and I just watched him, I wasn’t allowed to have a guitar, I don’t know why. I think because it was the beginning of rock and roll and I was young and I was so wound up about it that it really scared my mother (laughs). So I used to just sneak in my brother’s room and practice on his guitar when he was at football practice or on a date or something. I just taught myself to play. DAVID: People forget that rock and roll in those days was so new and scared a lot of folks. DUKE: That’s right. How I got around that whole thing was to build an electric guitar for a science project. That worked. Once I made it, they couldn’t take it away from me. DAVID: How old were you at the time? DUKE: I was thirteen. My father did most of the work because I was a kid. I didn’t know how to use a jigsaw. I drew it out of a piece of wood and we cut it out and took the neck and the bridge off of an old guitar. We bought a pickup and that was it. I was in a band about a week later. DAVID: Do you remember the name of the band? DAVID: That’s a pretty cool name actually. What kind of stuff were you guys playing at age 13? 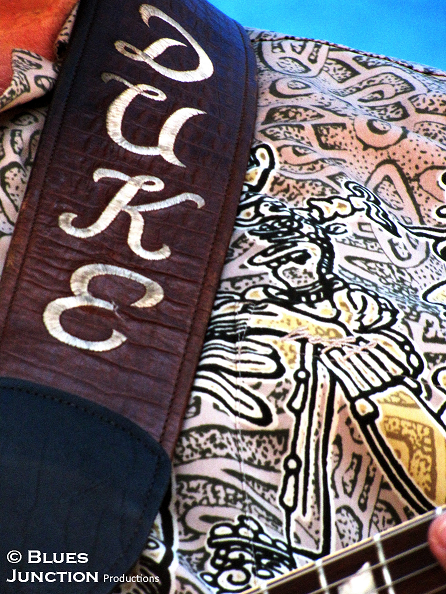 DUKE: Instrumental rock and roll, Duane Eddy, Link Wray, The Ventures you know, hits from the late 50s and early sixties. DAVID: What was it that steered you towards the music that you have been known for the last forty years or so? DUKE: Hearing the Count Basie Band and hearing all the blues that they played and realizing that you could play blues in the context of big band music. That was very interesting to me. Then I started picking up on Louis Jordan, Amos Milburn, Joe Turner and all those great rhythm and blues people. When I started hearing that music I started really searching it out, all over the place. I just became crazed with looking for records. I still am. DAVID: It is a lot of fun and a never ending road of discovery. DUKE: You know the bulk of that music I found was on 78s. I mean, I found bands like Louis Jordan and the Buddy Johnson Orchestra, and as I said, Amos Milburn, Wynonie Harris, Joe Turner that music really made me want to play it because I can sing this material and I don’t have to sound like I’m from the Delta, it’s a little more city oriented. It just seemed to fit and I loved the combination of the horns with the rhythm section. There always seemed to be lots of great soloists in those bands. The whole thing appealed to me. It had a bit of the jazz sensibility about the improvisational quality of the soloists. To me it just combined everything that I thought was good about music. DAVID: That style of blues was huge out here. DUKE: Oh yeah. There was a lot of great jump blues bands starting in the 1940s in LA. That whole Central Avenue scene was really kind of a hot bed of that style of blues. DUKE: I started that band in 1967. We started with just four, sometimes five pieces. It was the rhythm section bass and drums, guitar and piano, and sometimes we added a harmonica. 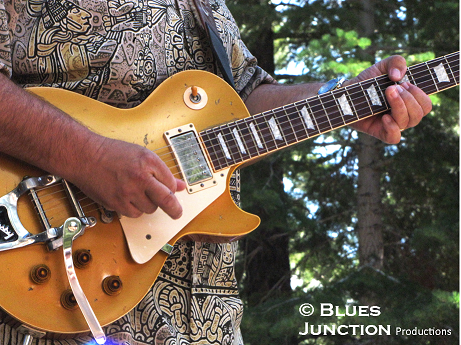 So we were doing more of the Chicago style blues, B.B King, Freddy King, Albert King and that kind of stuff. Just a few years later when I started really amassing a collection of 78s, I really wanted that sound with the horns. You know the bigger band sound, the jump sound. I kind of switched my focus over to that kind of sound. DUKE: At that time, I didn’t know anybody doing that, especially young white men. We had a severe reaction to it at some places. We had things thrown at us and somebody threw a cherry bomb at us in a disco one time. So it wasn’t always accepted, it took quite awhile for us to get a reputation. DAVID: Almost hard to believe, but by this time moving into the 70s, music was becoming highly commercialized and homogenized. How long were you with Roomful before you broke out on your own? DAVID: I first saw you perform in 1989 and if my memory serves me correctly you were backed by a two piece rhythm section. DUKE: That’s right. Throughout the 80s, I had that two piece backup band called, The Pleasure Kings. 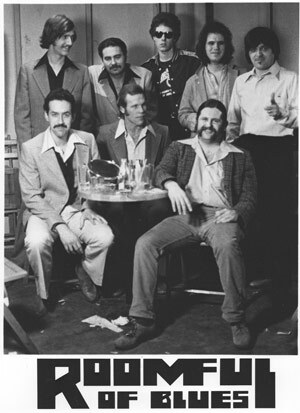 In 1990 I joined the Fabulous Thunderbirds and I stayed with them for about two and half years. Then I went back to the three piece format and started adding things after that. DAVID: I’d like to talk about the eclectic nature of your career…you’ve made straight ahead jazz albums, swing albums along with your more blues oriented material. DAVID: Early on I saw the correlation between blues, jump blues and jazz, and that’s because I listened to the bands from people like Buddy Johnson, Count Basie and Jay McShann who all had a lot of blues in their music. So I got into jazz from that angle. Then I started listening to people playing standards and a lot of the big band people like Duke Ellington’s band. All of the famous musicians that came out of that band were doing their own recordings also so I really followed the guys that were in Basie’s band and Ellington’s band. I also got into vocalists especially Billie Holiday. I was a big fan of female vocalists, especially at that time Helen Humes and Billie Holiday. That got me into the jazz sensibility. I still love the jazz from the 20s through the late 30s, it’s really my favorite time in music as well as the rhythm and blues that started in the early 40s and 50s. DAVID: Right, it is music that is so spectacular to me that I wish more people were hip to it. Was it during this period that you recorded the two albums with Herb Ellis? 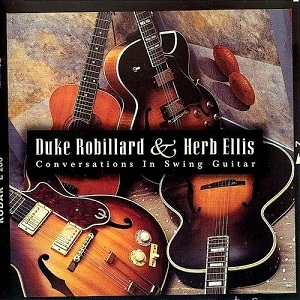 DUKE: Yes, they were Conversations in Swing Guitar. Actually, they were done at the same time and we had so much material that we had to put it on two records. DAVID: As far as your jazz career goes, the most recent foray would be the record that you put out last year called, Wobble Walkin and is billed as The Duke Robillard Jazz Trio. 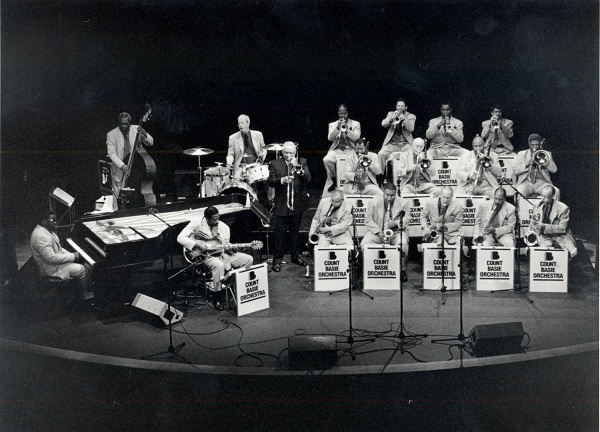 DUKE: The idea on that was that I wanted to primarily show off my guitar playing in a jazz sense and all the jazz tunes that I love were really old jazz tunes, basically, the standards and riff tunes of the 30s and 40s. My style is old and simple. It’s not really contemporary and it’s not harmonically adventurous. It’s more like blues playing to a jazz chord progression in a way. That’s my style. 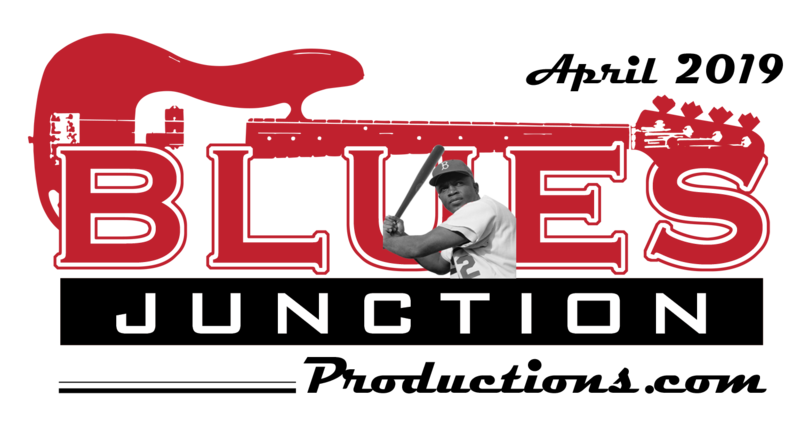 It’s just based on blues. DAVID: In the jazz idiom, is there anyone who stands out as an important inspiration for you? DUKE: All the older guys starting with Charlie Christian of course. Then there’s Oscar Moore with Nat King Cole, Barney Kessell and Herb Ellis. I also love Kenny Burrell and Wes Montgomery. Wes is not a big influence because he’s a little harmonically more developed than I am but I’ve picked up a few things from him and I certainly love his playing. DAVID: Let me shift gears here a bit and talk about a guy who, as far as I’m concerned, bridges the gap between jazz and blues as wonderfully as anybody. DUKE: T-Bone was the biggest role model to me musically for that very reason. He has got that jazz feeling in his playing. His soloing had a bit of a jazzy edge. T-bone was very important to me in that way. Really in the beginning all the really very bluesy and jazzy electric guitar players were coming from Missouri, Oklahoma and of course Texas. The southwest was where electric guitar really got its start. Whether it was Charlie Christian, T-Bone Walker or Elvin Chamblin with Bob Wills, there were so many from that area and that’s really my inspiration for guitar right there, all of those people. T-Bone and B.B. King are pretty much my biggest idols as far as blues guitar is concerned. DAVID: One of the things I find interesting about T-Bone is that of all that has been written about him through the years, no one mentions his vocals and I think he’s a tremendous singer. The only thing discussed is his guitar playing period. I think the same applies to what has been written about your music, Duke. Your singing is part of your performance both in the studio and in concert. Let’s talk about that aspect of your music. DUKE: As I get older, singing becomes a little hard for me (chuckles). I’ll be 65 this year. I just read a review online minutes before I called you that really panned my vocals. I never thought of myself as having a great voice but it’s part of what I do. I feel that most of the time I can make a statement with it. I’m from the school of thought that a lot of my favorite musicians that sang were not the greatest singers in the world but they put a song across and that’s the way I look at it. It’s a necessity because I’m a guitar player who writes vocal songs. DAVID: This might be time to talk about a vocalist I first heard on your 2009 album, Stomp the Blues Tonight, Sunny Crownover. She is terrific. How did you meet her? DUKE: I was asked to do a guest appearance with a band at Harvard by a professor who taught music. He was also a blues harmonica player, his name was Charlie Sawyer and he wrote a book on B.B.King. I think it may have been the first book written about B.B. Anyway, they asked me to perform as a special guest on that show. Singing in his band was Sunny Crownover. I was knocked out by the way she sounded. I liked her whole demeanor and the way she sings. Her voice is very pure. She really sings the song where a lot of woman blues singers want to just wail. I like the subtleties of her voice. So I started working with her and we put out an album for Stony Plain called Introducing Sunny and her Joy Boys which is an album of basically 30s standards and she did a phenomenal job on that. It got great reviews. I still have a real affection for that record. 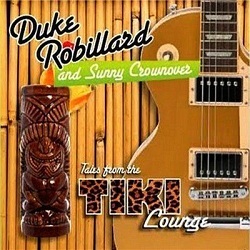 I don’t know if you‘ve heard my Tales from the Tiki Lounge album, that was first release on my Blue Duchess record label. It was kind of a tribute to Les Paul and Mary Ford. That’s a very interesting album. That’s one of my favorite recordings that I’ve ever made. Sunny sings on that album. DAVID: I think it’s an interesting record. I like it a lot for many reasons not the least of which it is so different. There has to be a back story with how you came up with the title of the record and tropical motif of the album art. DUKE: Well it came from an idea of exotica records, they probably didn’t call them that. In the late 50s there were a lot of records that were kind of stereo demonstration albums. They were all kinds of crazy things, a lot of times they had big bands, a lot of times they had bongos and congas. I don’t know if you’re aware of Martin Denny. DAVID: (laughs) I have been interviewing musicians for a long time and this is the first Martin Denny reference ever. Congratulations....he was the guy that made those records with the bird sounds. DUKE: Right...I kind of grew up in that period and had an uncle who was way into hi-fidelity when stereo was first coming out and would have these kind of records. It was a real novel thing back then. I took that approach in some way. Even Les Paul was kind of recording in that vein when he did his 50s recordings, multi-track recordings of guitar. So I just took a lot of elements of that and the whole tiki thing is part of that exotica motif that was through the late 50s and early 60s. Those were the kind of records you’d put on at a cocktail party you know. Back when everybody used to have cocktail parties. Everything is so different now. In the old days when people used to open up their houses and have cocktail parties, that is some of the music they would play (chuckles). That whole tiki lounge culture ties into that whole thing. DAVID: That kind of vibe seems to fit my neighborhood out here in Southern California but Pawtucket Rhode Island... really. DAVID: (laughs) I will try and remember that. You have a new album that is coming out April 9th on Stony Plain Records, Independently Blue. The big departure is that you have a second guitarist on this album, Monster Mike Welch. Let’s talk about Mike and the new record. DUKE: We played together at each other’s gigs on occasion over the years and have known each other forever. He’s a phenomenal blues guitar player and we just had this idea that doing a record together would be cool. Originally I wanted to do an instrumental record and us both kind of come up with material that would go in all different directions. 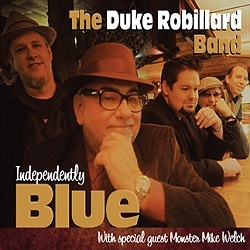 For some reason the idea of an instrumental album didn’t go over big with the record label, so I decided to do a Duke Robillard album as I perceived it and have Mike play on it with me. He does a great job. I’m very happy with the record. Our approach on these songs was not necessarily a show off guitar playing but showcase us playing together to make the song better. DAVID: There is a lot of very strong original material but I wanted to ask you about one in particular it is a love song that is also kind of a rocker with kind of a Chuck Berry feel to it. DUKE: It is called, Laurene. She is the Duchess! DAVID: We touched upon it when talking about Tales from The Tiki Lounge but let’s talk a little about your record labels. 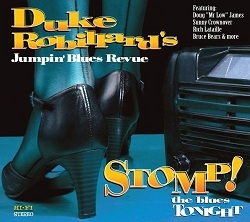 DUKE: Great...Blue Duchess is primarily for jazz recordings and Shining Stone is for more blues and roots artists. I’m doing a lot of producing, that’s another thing that I do. I have several albums on our label and I’ve produced for a lot of other people too. I just produced the new album that’s out on the EllerSoul label out of Richmond Virginia with a kid named Andy Paxon. He just turned eighteen and he’s a fabulous songwriter, singer, guitar player. I play a little on it. It was my band and the Roomful of Blues horns. It’s a really strong album. DAVID: What do you think you bring to the table as a producer besides a lot of experience obviously? DUKE: Every project is different. Production really means in the end, getting the job done as good as it can be. Some artists need help with material and direction, some artists don’t. Some artists just need some encouragement and support and the right person picking the right things and adding whatever should be added to it make it a great record. There’s many different ways to produce. I’ve heard of producers that basically don’t do anything but hang around while the record is being made. There’s a famous rock producer that kind of has that reputation of not really doing a lot but his records end up hit records. So production can be many things but also a big part of it is working with the engineer mixing it also to be sure that the end product has a great sound. DUKE: (laughs) Starting Monday I will be a member of Bob Dylan’s touring band, and I’ll be doing that throughout the year and also touring with my own band. DAVID: I know you’ve recorded with him, have you ever toured with him before? DUKE: No, I never have. I’m really looking forward to it. I love his music. I love his writing of course. He is the most iconic songwriter in America...maybe in the world. DAVID: Good luck with the tour. DUKE: Thanks Dave. If you need anything from Blue Duchess or Shinning Stone let me know. DAVID: Thanks again for your time today Duke. I really enjoyed it. Oh I almost forgot where do you get your Hawaiian shirts? DUKE: (laughs) Anywhere I can.